KIEV, Ukraine -- Along the picturesque shores of Estepona in southern Spain's Costa del Sol lie some of Europe's most elegant resorts and luxury estates, whose owners and residents include Hollywood actors, superstar athletes, and some of the continent's political elite. The Spanish villa owned by Ukrainian President Petro Poroshenko. Corruption has been a persistent problem in Ukraine, contributing to political stagnation that followed the so-called Orange Revolution in 2004-05 and the Euromaidan unrest a decade later that unseated a president. Western officials and international financial institutions insist such criminality is still a problem and threatens billions in assistance that have helped keep the country afloat since Russian troops invaded and seized Crimea from Ukraine in early 2014. Documents obtained by Schemes show Poroshenko's Spanish-registered Feruvita S.L. 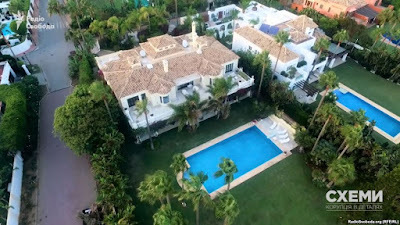 -- listed in the president's declaration -- bought a 23-year-old villa in Estepona in the summer of 2008, when he headed the Council of Ukraine's National Bank. In the financial statements, the value of the two-story, 1,254-square-meter villa and grounds, complete with swimming pool, is estimated at 4 million euros ($4.3 million). The gated, white-columned villas belonging to Kononenko and Hladkovskyy were discovered by Schemes journalists within short driving distances of Poroshenko's property. Kononenko also owns a second parcel of land on the coastline where a house was demolished in 2012, apparently to make way for a new one. Poroshenko "comes two days here and leaves," one man, whose gardener also does landscaping for the Poroshenko estate, told a Schemes journalist. "He rests a day or two. Not for a week or month, no, no." In March, Poroshenko was photographed by the Ukrainian news site Ukrayinska Pravda making a purchase at a Spanish pharmacy and driving away in a white Porsche. The site also published images of what was believed at the time to be the president's Spanish villa. Daria Kalenyuk, executive director of the Kiev-based NGO Anticorruption Action Center, told RFE/RL that an independent investigation should be conducted by Ukraine's National Agency for the Prevention of Corruption to determine whether Poroshenko, Kononenko, or Hladkovskyy violated Ukrainian law by not declaring the villas directly in their declarations. "The enterprises in which Petro Poroshenko is the ultimate beneficiary have overseas property such as factories, shops, warehouses, administrative buildings, and houses. All this is in the form of legal entities specified in his declaration in accordance with the Law 'On Prevention of Corruption.'" But Kalenyuk and other activists complain the legislation is imperfect. For instance, she said, "vague" language in the law has allowed officials to get away with not declaring assets owned by companies that they control. But Ruslan Radetskyy, the deputy head of the National Agency for the Prevention of Corruption, told Schemes that the language in the law was specific enough. "[The declarant] must specify all property that belongs to him, through a company or as an individual," he said. "In my opinion, there is evidence of breach of the law 'On Preventing Corruption' by the president of Ukraine, who did not declare the villa in Spain in his electronic declaration," he told Schemes. "The explanation from representatives of the presidential administration that the owner of the villa is not the president, but a company that he controlled, is incorrect."